It was an eventful Sunday evening last week, January 23, 2011. 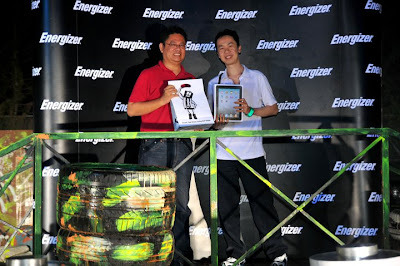 I was there as a representative for my friend to receive a prize for the Energize Me contest. So my original plan was to head on down and register, then drive out for dinner or something and then only drive back to attend the prize presentation ceremony. 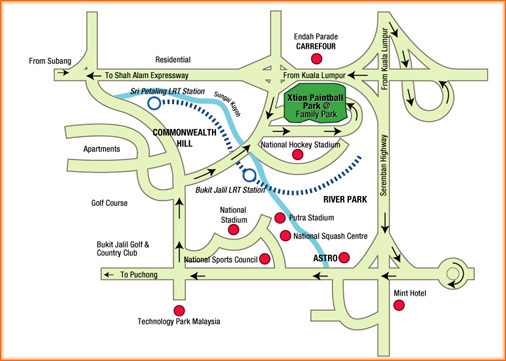 So I made my way to the Xtion Paintball Park based on the map and my GPS. Surprisingly, it only took me around 25 minutes to reach the vicinity of the location. Unfortunately, that area (Bukit Jalil) being the Express Bus terminal while Pudu Raya is under renovation has caused it to be pretty jammed up. And so it took me another 10 minutes to find my way into the secluded spot of where the action will be held. Good thing they put up direction banners, otherwise, I don't think ANYONE can find such a secluded spot. I arrived exactly 7pm which was the time set for the registration to start but seeing the rain was unabated and wanting to avoid the jam outside, I opted to stay at the briefing area and make full use of the free wifi that was available. Once the rain settled and close to what seemed like forever, the paintball teams were being prepared to face the semifinals and finals round to determine the champion, 1st runner-up and 2nd runner-up of the entire tournament. and a briefing to the players of the dos and don'ts and to clarify any doubts the players have. Sitting right at the back, a father and son who's also a finalist for the Energize Me contest. They're the ones who made the whole night really eventful. while waiting for the tournament to start, I headed on back to the HQ to sit there and enjoy the free wifi. It was then they (the father and son) approached me. They spoke Mandarin to me and despite me saying I'm not good in Mandarin they continued on speaking in Mandarin to me. From my limited ability in Mandarin, I managed to gather that they're from Penang, they're here because the son is a finalist for the Energize Me contest and they need assistance to give them a ride to the express bus station once the prize presentation is over. I thought, fair enough. I could help them out. After all, the express bus station is just outside from this secluded area which would be ridiculous to walk all the way out as they did walking in. The roads pretty dark too with the absence of street lights all the way in. So then, as the tournament's about to start, I settled into the play area to watch the tournament since I'm sticking around now. A shot of the field without the spotlights. Referees were in position, the announcer who barely had his voice strained as hard as he can to make announcements and things began which I hope could excite me. Unfortunately, the first match was such a letdown I began losing my interest in watching it again. There's hardly any action that I can see and most of them, just camped at a safe location without moving. It pretty much went on the same on most rounds. There's only one round that's pretty nice to watch where a team overwhelmed the other side before time was up therefore you could see a lot of action in that one. since the rest of the shot is just too plain dark and I can't use flash otherwise I'll give away a person's position and I don't wanna go in to the battleground just to snap a few shots wearing those protective gears even though I was allowed to. So I stayed most of the time hanging out with the Advertlets bloggers and staff since they're there to cover the event. Rebecca of www.rebeccasaw.com brought so much stuff that she looks like she's having a picnic there! After around midnight with much hanging around and chatting rather than watching the paintball fight, it was time to announce the winner. Guess who went home with an iPad? Yeap. Me! But of course, the iPad isn't mine. LOL. The father and son got 2nd prize which was a Powershot compact camera. Me and them were lucky that it was worth staying around but those with the consolation prize were not as lucky because all they get was a goodie bag. Not worth waiting for and I do feel for them if they waited around 5 hours without dinner just for that! I looked for the father and son and off we go as quickly as we could since it's already 12.30am that day. Unfortunately for them, their plan to take the 11.30pm bus had failed since it's already way past that time. And so with my limited understanding of the Mandarin language again, I somehow manage to communicate with them and decided to find them a hotel to stay instead. 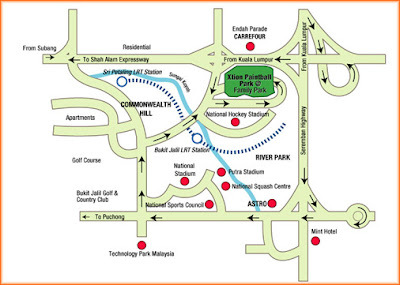 At 1st I was thinking of Sunway Lagoon Resort Hotel since I was passing there but eventually, I thought it might be a bit too expensive for them and was thinking of a cheaper alternative which was Lisa De Inn at Section 17. But upon passing by Sunway Pyramid, I saw a sign saying Sun Inns hotel and figured that couldn't be expensive and sent them there to inquire. It's not easy to find Chinese food way past midnight but good thing I know of Asia Cafe at Subang Jaya since we're near there. The food isn't that good but at least there's Chinese food, hehe. After the meal (thanks to them for the meal treatment), I sent them off back to the Sun Inns hotel and off I go headed for home. Although I arrived home around 2.30am, yet I feel a sense of satisfaction on helping out those folks knowing genuinely they appreciated it even though we weren't able to communicate with each other much due to my limited grasp of the Mandarin language. Gah! It helped me through the next horrid working day bringing a smile to my face thinking about it. So people, sometimes, doing a bit of helping out although not much can bring a smile to you when you know it's much appreciated. Well, at least it did for me. ** typo error. I mean, if i love you till you dead, you should feel honored! Hahaha! 'cos i don't shower love to people randomly! :> wakaka!